If you work in New York, it is important to understand the at-will employment doctrine, which means that an employer can fire an employee without any notice at any time for any reason or even no reason at all. If this is concerning to you and you would like to know more about your rights as an employee in New York, this post is for you. The at-will employment doctrine in New York. The exceptions to the at-will employment doctrine. What if you have an employment contract? What to do if you were unlawfully terminated. 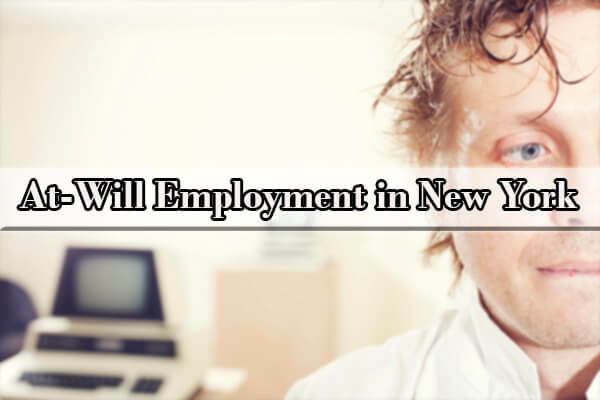 What is At-Will Employment in New York? New York is an at-will state, meaning that, but for one of the exceptions, all employees are considered “at-will” employees. This means that an employee can be fired without warning at any time for any reason or no reason at all. Unfortunately, the employer’s reason for terminating an at-will employee can seem unfair, unethical, or even immoral, but could still be deemed lawful. However, there are exceptions to the general doctrine of at-will employment. There are some reasons for termination that are illegal under federal and state law. For example, the majority of employees are subject to anti-discrimination laws and cannot be fired based on certain protected characteristics, such as gender, race, religion, age, disability, national origin, and sexual orientation. Similarly, an employee cannot be fired for complaining about discrimination based on a protected trait, discriminatory harassment, wage violations, or specific types of safety violations. Likewise, an employee cannot be fired because he or she has exercised a legal right, such as taking time off for family and medical leave, military service, jury duty, or voting in an election. The justification of the New York at-will employment doctrine is that because employees are free to resign from their jobs at any time without giving a reason, the employer should have the same right and be able to let the employee go without giving a reason. Many employers will have an employment handbook containing a boilerplate provision in which it makes clear that all employees are at-will employees. While it may seem like the employer has all the leverage and the employee is at the mercy of the employer, that is not necessarily so. You still have rights and if you feel that your employee rights were violated you should seek legal help. Call the Law Office of Yuriy Moshes, P.C. for a free consultation. What Constitutes a Wrongful Termination in New York? A wrongful or illegal termination occurs if the termination violates one of the laws that protect New York employees or breaches an existing employment agreement. Although New York is an at-will state, employees still have the right to be protected against the breach of any oral or written contractual agreement between the employer and employee, as well as protection against any illegal acts by the employer. the termination was in retaliation for serving jury duty. Every case is different and each is analyzed and determined on a fact specific basis. Experienced New York employment attorneys at the Law Office of Yuriy Moshes, P.C. will evaluate your case and advise you on the best course of action to take. The above examples dealt with an “at-will” employment status. Some employees are hired under an employment contract that provides the terms and conditions of their employment. Sometimes, employees hired under a contract may not be considered “at-will” and might only be subject to termination according to the terms and conditions of the contract. For example, some employment agreements will state that the employee can only be fired “for cause” during the duration of his or her employment. Other employment agreements might mandate that the employee be given proper notice before termination. In such cases, firing the employee without warning or notice would be a breach of contract and would give the employee a legal claim. Where an employment contract contains a term of employment for an indefinite period of time, it is presumed to be an employment at-will that is freely terminable by either party at any time for any reason or even for no reason. We encourage you to contact an employment rights attorney if you feel that your termination might be illegal or in breach of your employment agreement. In New York State, employees can recover statutory damages resulting from an unlawful discriminatory/retaliatory termination, or contractual remedies resulting from a breach of contract. Statutory remedies such as lost wages, punitive damages, liquidated damages, compensation for emotional distress, attorneys’ fees, and costs can be recovered under certain laws. For example, an employee fired due to a violation of the Family and Medical Leave Act (“FMLA”) is entitled to recover lost wages, liquidated damages (twice the amount of lost wages) as well as attorneys’ fees and costs. Likewise, the New York City Human Rights Law provides employees with the right to collect lost wages, compensation for emotional distress, attorneys’ fees, and costs, as well as unlimited punitive damages for any form of employment discrimination, including sexual harassment. An important thing to remember is that all employees have a duty to mitigate their damages even if the employees were wrongfully fired. This means that all employees have the responsibility to make good faith efforts to seek new employment and find another job. Employees should always document the steps they have taken during the job search so there is evidence that the employees satisfied their obligation to mitigate their damages. This is important because the employee may be entitled to the difference between his or her old salary and the new one. Should I Agree to At-Will Employment? As stated above, all employees in New York are automatically deemed to be employees at-will, unless otherwise agreed. Many employers nonetheless take steps to ensure that the at-will nature of the employment relationship is clearly established and agreed-to by all parties. This is typically spelled out in employment applications, contracts, and employee policy and procedure manuals. The policy may label it as “at-will employment” or may simply state that employees can be terminated at any time without cause or for any reason. Thus, just because you are presented with an employment agreement, this in no way means that you are not an at-will employee. Before signing the agreement, review it to determine whether it contains any exception to the at-will employment doctrine, and if not, make sure that you understand that you can be terminated at any time for any reason. If your employer makes some verbal promise to you whereby the employer agrees to employ you for a certain amount of time or tells you that you can only be terminated for specific enumerated reasons, ask that it be reduced to writing. 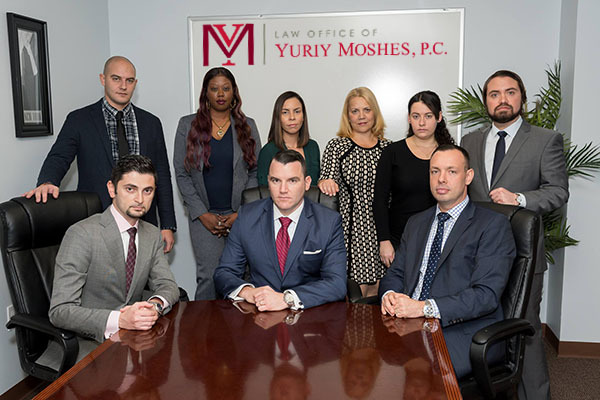 If you have any questions about your employment agreement or at-will employment in general, please call the experienced employment lawyers at The Law Office of Yuriy Moshes, P.C. 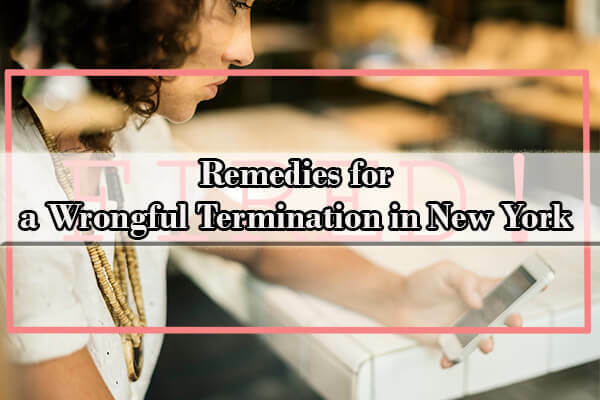 While there is no such legal claim as “wrongful termination” in New York, there are actually many employment and labor laws that an employer can violate when terminating an at-will employee. For example, just because you are an “at-will” employee, this doesn’t give your employer the right to fire you for any reason – particularly if they run afoul of state or federal anti-discrimination or anti-retaliation laws. As discussed above, state and federal laws prohibit discrimination based on several categories, including but not limited to, race, religion, gender, age, national origin, disability, pregnancy status, sexual orientation, and gender identity. If your employer has terminated your employment due to a discriminatory reason, you can bring a legal claim against the employer. Contact an at-will employment lawyer to get a free consultation on your case. If you believe you were treated unfairly by your employer, you may want to speak with a New York employment law attorney. Get an evaluation of your employment-related issue from experienced employment attorneys at the Law Office of Yuriy Moshes, P.C. today. Q: Is New York an at-will state? A: Yes, New York is an at-will state. Q: Should I sign an at-will employment agreement? A: Courts have generally held that an employee can be terminated, or not hired, for refusing or failing to sign an at-will employment agreement. While you are not technically required to sign the agreement, if you want to get hired or keep your job, it may be in your best interest to sign the agreement. Q: I have an employment contract. Does that mean that I’m not an employee at-will? Q: What are cases when an at-will employee cannot be terminated? A: Pursuant to the New York State Human Rights Law and the New York City Human Rights Law, an employer may not terminate an at-will employee based on the employee’s membership in a protected class. Likewise, the New York Labor Law prohibits employers from terminating an employee for his or her off-duty political or legal recreational activities outside of work, legal use of consumable products outside of work or membership in a union (N.Y. Labor Law § 201-d). Employers may also not terminate or discriminate against an employee for making a complaint to the employer or the commissioner of labor regarding purported violations of the New York Labor Law, including a violation which “creates and presents a substantial and specific danger to the public health or safety, or which constitutes health care fraud” (N.Y. Labor Law §§ 215 and 740). Q: Can you file a wrongful termination lawsuit in an at-will state? 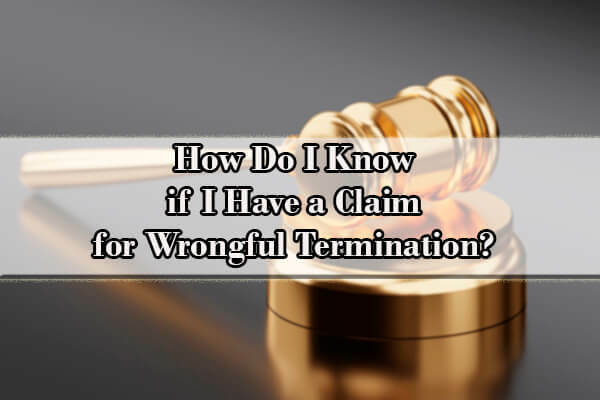 A: There is no such thing as a wrong termination cause of action in New York. Wrongful termination is not a legal claim. If you were fired for a discriminatory reason, you can sue for discrimination. If you were fired for a retaliatory reason, you have the right to bring an action for an unlawful retaliatory termination. Also, if you were fired in violation of the terms and conditions of your employment agreement, you can sue for breach of contract. Q: Are there state-specific rules on when final paychecks are due after termination? A: Regardless of whether an employee voluntarily leaves his or her job or is terminated, the employer must pay the employee’s wages not later than the regular pay day for the pay period during which termination occurred (N.Y. Labor Law § 191). Q: Does an employer have to give written notice of termination? A: Yes, New York Labor Law § 195(6) requires employers to provide written notice to discharged employees, stating the effective date of termination. The notice must also provide the exact date that any employee benefits, such as health, accident, and life insurance, will cease. This notice must be given to the employee no later than five (5) working days after the date of termination. Q: Can I collect unemployment if I was fired as an at-will employee? A: Yes, New York allows at-will employees terminated through no fault of their own to qualify for unemployment benefits. Q: I have a new job offer. How do I know if I’ll be employed at-will? A: All employees in New York are automatically deemed to be employees at-will, unless otherwise agreed. Look through your handbook and all other documents that were provided to you and see if any of them mention that you are an at-will employee. Even if your employer does not use the term “at-will,” any language implying that your employment can be terminated at any time for any reason means that you are an at-will employee.